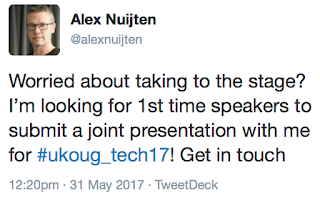 Yesterday there was an email coming from the UK Oracle User Group (UKOUG) about their upcoming Tech conference at the end of the year. There was a call to action to get more new speakers, but with a twist. This email wasn't directed at everybody, but specifically to people who have presented before at a UKOUG event. Why would you sent an email to look for new speaker and only address the people that "have done it before"? The call to action was basically: "reach out to new speaker by offering to do a joint presentation". Now where did that idea come from? A while ago I read a blog about the APEX Connect 2017 conference, it was posted anonymously and in German (Thank you Google Translate). Some parts of the blog were very positive, but there was also a critical note about the number of new speakers at the conference. How the agenda was put together for the APEX Connect 2017 conference is up to the conference committee, there is only so much you can do about that - like providing feedback. But that blog did get me thinking... I know that a lot of user groups really want to have new speakers, I also know that there are a lot of people out there that have a story to tell. When I talk to people, at conferences, on the work-floor, anywhere and ask them about doing a presentation a lot of the same answers can be heard: "What I do is very simple" "I wouldn't know how to write an abstract" "I've got nothing to say" "so and so is an expert in that field, I've got nothing to add to it" "Nobody will show up" etc. etc. etc. After a brainstorming session with Chris Saxon (while lunching at the RigaDevDays conference) and Jan Karremans (while waiting at the airport) I came up with the idea of a joint-presentation. Get a new speaker hooked up with a more experienced speaker and let the magic happen. Did you get a question that you don't know the answer to? There is someone else on stage that might know the answer. The more experienced speaker can help with the above, and perhaps more. Doing a joint presentation is a lot of work, it takes serious effort to put it all together. When you've done a presentation before you know this, and because of this I was pleasantly surprised to see so many speakers reaching out. 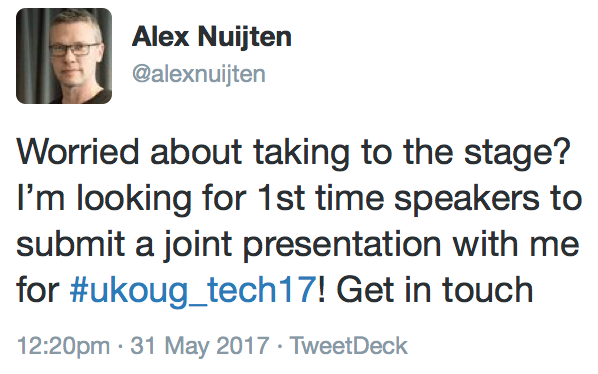 Alright, so if you've ever considered doing a (joint) presentation about SQL, PL/SQL and/or APEX - get in touch.